VANCOUVER, June 13, 2018 /CNW/ - Bonterra Resources Inc. (TSXV: BTR) (OTCQX: BONXF) (FSE: 9BR1) (the "Company" or "Bonterra") is pleased to announce the latest drilling results from the ongoing resource development program at the Gladiator Gold Deposit. The drill results included an intersection of 44.9 g/t Au over 3.0 m, which extended a high-grade ore shoot of the Footwall Zone up-plunge to the west in the Rivage Gap area. Hole BA-18-34 intersected the Footwall Zone with 44.9 g/t Au over 3.0 m, extending a high-grade ore shoot to the west, up-plunge in the Rivage Gap area. Hole BA-18-36 extended the North Zone by ~150 m to the east, down-plunge of a defined ore shoot with 8.4 g/t Au over 3.0 m.
Infill holes BA-18-27A, BA-18-30 and BA-18-31 intersected the Main Zone between 300 to 500 m below surface, demonstrating the continuity of mineralization with 24.3 g/t Au over 5.0 m in BA-18-30 and 9.6 g/t Au over 3.5 m in BA-18-31. Hole BA-18-28 intersected the North Zone in the Rivage area, extending the zone down-plunge in the western part of the deposit, with 5.3 g/t Au over 1.3 m.
Holes BA-18-27A and BA-18-30 intersected the North Zone adding definition between 300 to 400 m depth with 7.2 g/t Au over 2.0 m in BA-18-27A. To date, continuity of mineralization is now confirmed over a total drilled strike length on at least four horizons (North, Footwall, Main and South) of 1,200 m, as well as a drilled depth of over 1,000 m.
"The resource development program continues to be extremely successful in terms of the extension of mineralized zones and in terms of demonstrating high grades throughout. Most significantly however is how well we have shown continuity down dip and along strike for all five of the primary zones to date. The high grades encountered on the west side of the deposit and the down plunge of the east side announced today are of obvious significance to the deposit as a whole," commented Nav Dhaliwal, President and CEO of Bonterra. Results from the winter drilling campaign at the Gladiator Gold Deposit successfully extended the deposit both west and east. The drilling program opened multiple zones for further expansion from surface to depth. Recent drilling in the west side of the deposit extended the North Zone and now totals a strike length of approximately 1,300 m.
Bonterra continues with the aggressive resource development program with five drills at the deposit focused on infill and step-out drilling in preparation for the updated mineral resource estimate in the second half of 2018. Well financed with approximately $65 million raised since 2017. 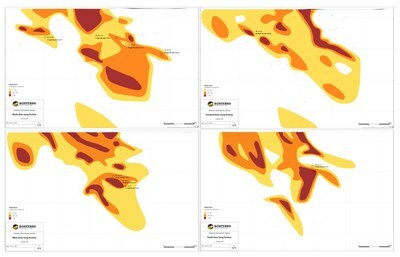 Drilled dimensions of the Gladiator Gold Deposit are currently outlined to a depth of over 1,000 m below surface, and a strike length of 1,300 m.
This press release contains "forward-looking information" that is based on Bonterra's current expectations, estimates, forecasts and projections. This forward-looking information includes, among other things, statements with respect to Bonterra's exploration and development plans. The words "will", "anticipated", "plans" or other similar words and phrases are intended to identify forward-looking information. Forward-looking information is subject to known and unknown risks, uncertainties and other factors that may cause Bonterra's actual results, level of activity, performance or achievements to be materially different from those expressed or implied by such forward-looking information. Such factors include, but are not limited to: uncertainties related exploration and development; the ability to raise sufficient capital to fund exploration and development; changes in economic conditions or financial markets; increases in input costs; litigation, legislative, environmental and other judicial, regulatory, political and competitive developments; technological or operational difficulties or inability to obtain permits encountered in connection with exploration activities; and labour relations matters. This list is not exhaustive of the factors that may affect our forward-looking information. These and other factors should be considered carefully, and readers should not place undue reliance on such forward-looking information. Bonterra disclaims any intention or obligation to update or revise forward-looking information, whether as a result of new information, future events or otherwise.